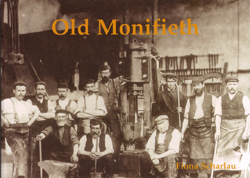 As did many rural villages in Scotland, Monifieth was transformed during the eighteenth and nineteenth centuries from a sleepy farming hamlet into a bustling industrial town with the advent of Low's foundry and the jute weaving trade. The twentieth century brought less sweeping but more deep seated change as industry gradually declined. Monifieth Foundry finally closed in 1980, a victim of the demise of much traditional British industry during that period. This collection of photographs, largely from the lantern slide collection of former Monifieth Town Clerk, Ian Allen (to whom the volume is dedicated) provides a fascinating glimpse into nineteenth and early twentieth century life in the town. Included are images of motor bike racing on the sands, a serious sport in the 1930s, the Monifieth fire brigade with helmets beautifully polished, standing with their equipment on Hill Street in 1900, top hatted dignitaries posing for the cameras at the official opening of the tramway to Dundee and an early twentieth group of foundry apprentices thoroughly enjoying a day out.